"This recipe features the unusual and exotic Chinese five-spice powder. Peaches are a natural pairing for the aromatic blend of anise, ginger, cinnamon, cloves, fennel seed, star anise, and Szechuan peppercorns, which usually make up this thousand-year-old spice." Preheat oven to 375 degrees F (190 degrees C). Line a baking sheet with a silicone baking mat. Whisk sugar and Chinese five-spice powder together in a small bowl. Beat egg and water together in another bowl. Melt butter in a large skillet over medium heat. When the butter foams, arrange peaches in a single layer in the skillet. Pour sugar mixture over the peaches; cook, turning peaches once, until sugar is melted, bubbling, and syrup has a tan color, about 2 minutes. Transfer peaches and syrup to a bowl to cool completely. Cut pie crusts into eight 4 1/2-inch rounds. Set rounds on prepared baking sheet and fold edges of each crust up to form a 1/2-inch rim. Brush each crust with egg mixture. 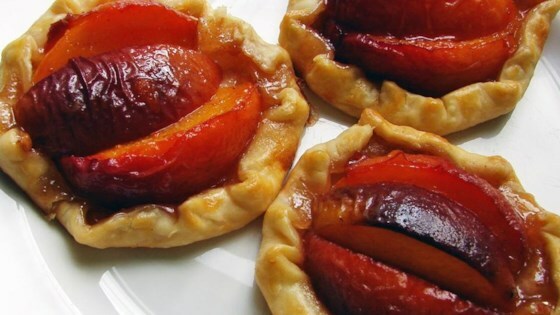 Place 2 peach slices, pit-sides facing each other, in the center of each tart. Place 1 peach slice in center, skin-side up, in between the other two peaches. Drizzle excess syrup over the peaches. Bake in the preheated oven until golden and bubbling, about 15 minutes. See how to make an impressive but so simple fresh peach dessert. You can use my Easy Homemade Pie Crust recipe if you like. Chef John has done it again. These are fantastic. I had to go to the Chinese items in grocery store to find the five spice powder. It made the tarts special. After watching the video about how to make this, it was so simple to make. So easy and delicious! A little time consuming, but so worth it....they don't reheat well, so eat them right away. Made exactly like the recipe...great. Want it better? Add a little natural vanilla ice cream...awesome! No changes perfect like it is.